This foot warmer mat will keep your toes warm and toasty! Add the comforts of softness and warmth to a hard floor with this carpeted heating mat. The Cozy Toes mat has been designed so warmth travels upward, circulating around your feet and legs. Contains an electric heating element that produces a uniform radiant heat. It is thermostatically controlled so that heat will be maintained at a constant temperature. 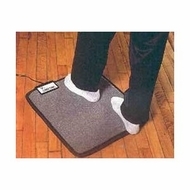 The heating element of this foot warming mat is molded within the rubber to eliminate the danger of fire or electric shock. 75 watts, 0.7 amps. UL approved. . Keeps your toes toasty and warm. Warmth travels upward, circulating around your feet and legs.